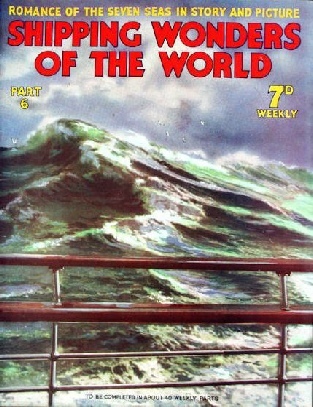 Part 6 of Shipping Wonders of the World was published on Tuesday 17th March 1936. 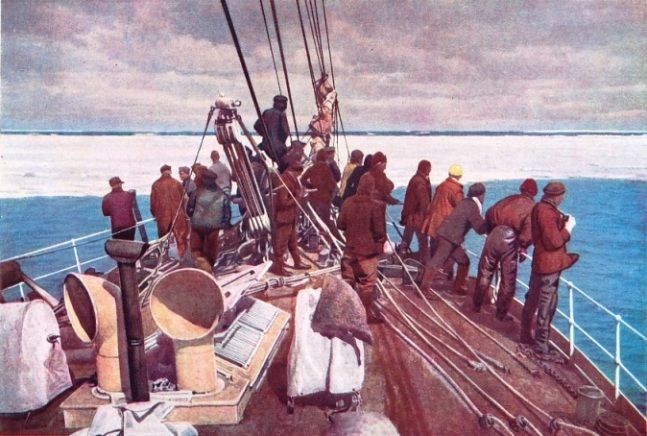 It included a colour plate illustrating the “Terra Nova entering the pack ice of the South Polar regions”. This accompanied an article on Scott’s Gallant Failure. The coloured plate was attached to page 173 of this issue. There was no photogravure supplement. The cover of the current part has a special interest for me. I wanted a cover showing a heavy Atlantic sea. This kind of picture is not easy to find, but I tracked the photograph (from which this cover was made) by boarding the Bremen at Southampton, and finding it in the official photographer’s collection in that ship. The photograph was taken from the Bremen when she was in mid-Atlantic. It was later used as the colour plate with part 21 called “Stormy Seas of the Atlantic Ocean”. The Bremen also features on the covers of part 11, part 20 and part 23. Click on the small image to see a short clip from a British Pathe newsreel “Wonderful Engineering Feat” showing the refloating of the Leonardo in 1921. The Antarctic Expedition of 1911 stirred the imagination of people throughout the world and gained for captain Scott and his heroic companions a place among the immortals. The article was written by Lieut.-Com. R. Gould and contains some special photographs taken by the late H. G. Ponting, FRGS, official photographer of the 1911 expedition. This is the second in the series on Epics of Exploration. The colour plate issued with this part is reproduced above. It was attached to page 173. Prelude to Adventure. Captain Scott’s ship, the Terra Nova, entering the pack ice of the South Polar regions. The Terra Nova left Lyttelton, New Zealand, over eleven months before Scott began his great journey to the South Pole from the base camp at Cape Evans. On the voyage south the ship was caught in a gale and narrowly escaped foundering. Later she was imprisoned for three weeks in an ice-pack. The Terra Nova (764 tons) was originally a whaler built at Dundee in 1884. She had served as relief ship in Scott’s Antarctic expedition of 1904. A weapon of offence and defence, the submarine is one of the most interesting arms of a modern navy. Hector Bywater describes submarines and how they are operated - a subject of extraordinary interest, no matter what opinion you may hold about the desirability of these craft. This is the third article in the series The Navy Goes to Work. Frank Bowen describes one of the finest ships of her type. The clipper Ariel is still remembered for her achievement in the exciting and historic race from China to London in 1866. A colour plate of the Ariel appeared in part 1. This is the second article in the series Speed Under Sail. When the steamship Trevessa sank in the Indian Ocean, her officers and crew sailed over 1,500 miles in open boats, displaying endurance and seamanship that maintained the high traditions of the sea. Sidney Howard describes a great voyage which was undertaken in emergency. The question of disaster at sea is an important one. We know that to-day sea travel may claim a high margin of safety; yet, at the same time, when disaster threatens or becomes a fact it produces a quality in the right type of man that is invariably produced by any other serious crisis. Those of us who know the sea know that much. The article is concluded in part 7. Germany’s two luxury liners, the Bremen and the Europa, have not only played an important part in their country’s mercantile revival, but have added also an immortal chapter to the history of transatlantic travel. The article is by H G Castle, and it is the fourth in the series on The World’s Largest Ships. Click on the small image to see a British Pathe short newsreel clip “Atlantic Crossed in 4 days 17 hours” showing the Europa on her maiden voyage having clipped 18 minutes off her sister’s record.